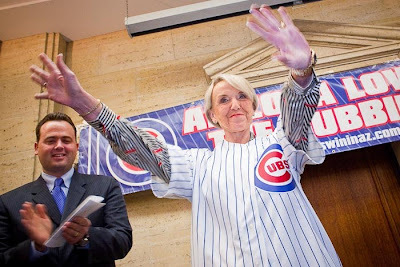 The photos: Arizona Governor Jan Brewer waves after slipping on a Cubs’ jersey at a press conference Wednesday morning. I always try to get to assignments a little early. 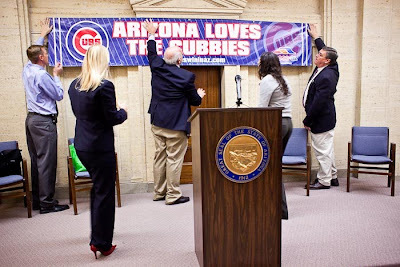 In this case, it paid off when some Mesa boosters started hanging a Cubs banner in front of the press conference podium before the party started. The lovable losers, those hapless Chicago Cubs won a big one earlier today. They talked the city of Mesa into building a new stadium for their spring training and will partner up with Mesa to develop “Wrigleyville,” a shopping, entertainment and dining destination themed to the Cubs. The Cubs have held spring training in Mesa for 57 years. Some say modern spring training was developed by the Cubs in Mesa but those upstarts in Naples, Florida tried to lure the Cubs to the Sunshine state. Mesa though won the day by promising a new stadium and the development on an undeveloped land on the edge of Mesa. It’s not quite a done deal yet though. The agreement has to pass muster in the state legislature, which is likely given the legislature’s Republican leanings and the fact that Mesa politicians supporting the deal are all from the GOP. What’s not so certain though is whether or not Mesa voters will sign off on a sales tax hike to support the deal. The tax hike will go to the voters. Most in Mesa voters love the Cubs but hate taxes (Mesa is big Tea Party protestor country) so it’s something of a toss up. I thought it was fitting that the venue for the announcement and press conference was the old state Supreme Court Chambers in the Arizona’s old capitol building. I suspect it will end in the courts before it’s decided because the conservative/libertarian Goldwater Institute, which opposes such deals, could decide to sue the city of Mesa over the deal. There’s a lot more about Mesa and the Cubs in the Arizona Republic.